I love to knit... that's not a shock to you all! Even if you are a new reader, you can tell just from my title that knitting is a part of my life. 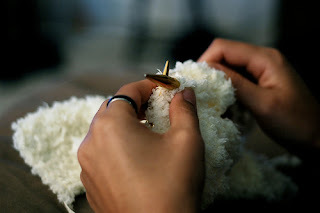 "For you created my inmost being, you knit me together in my mother's womb"
How exciting to start each project I knit... how exciting to see the finished result.....How God must be so proud of His finished products! Very good reminder that even if we aren't perfect, God still brags about us (at least I hope he does!). Thankfully, I'm still a work in progress and God isn't finished with me yet! Have a blessed day, Rebecca! Yeah on your knitting. Have a great day. I love this! and love that verse!! Rebecca Jo, you are SO wise. I'm seriously wondering what God was thinking when he knit me! Yes, I think God is excited with each one of us just as you are about your knitting! How often we forget those words. Thanks for reminding us!! I hope God is proud of his creation when he is finished with it. I am still a work in progress. I too have many knitting projects going at once. Not as many as you but at least three. I'm sure he probably had a difficult time trying to explain us. I am buying a book at Walmart to teach me how to knit. It makes my heart sing to think that He is always excited about us. He loves us all so much. Even if we are still works in progress (as I am)!!! Aww, I loved that!! I can just imagine them asking him that, "What are you making?" So cool! So true my dear. You always keep me so lifted, thank you! Pictures - who do you use? Hold On... I have to finish this row!